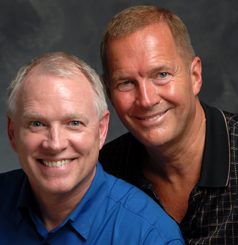 Nutter ( left ) and Burgess have been a couple since 1976; they donate and volunteer for a range of gay and AIDS groups. Nutter served two years in Vietnam and works in healthcare. He has served on the board of Howard Brown. Burgess is a senior executive with Walgreens and has helped guide their support of gay and AIDS groups. Burgess is a founding member of the Business Council for the Human Rights Campaign.